England captain Chris Robshaw hopes the recent incident involving winger Chris Ashton does not force rugby players to stay "locked away at home". Ashton was attacked with a glass during a night out with his girlfriend. "What people love about rugby is that they can still see you after a game having a drink with some mates, or going out for dinner," said Robshaw. "As soon as you lose that touch and isolate the players, it wouldn't be great for the game." He added that the "beauty" of rugby union is that players are "connected" with the public. 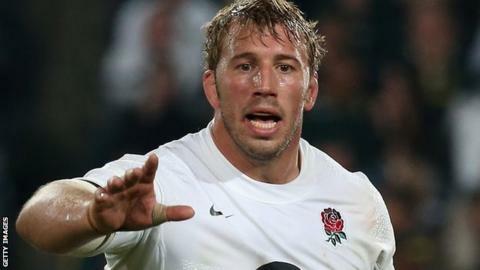 "The amount of people who get pleasure from having the odd interaction with players from time to time, in the street or in a restaurant or in a pub, far outweighs the odd bad incident," said Robshaw. England international Ashton revealed on his Twitter account that he had been involved in an incident, writing: "Some bloke decided to spoil an evening out for me and my missus. No stitches needed." His club, Saracens, immediately issued a statement explaining what had happened and praising his restraint in light of the attack. "Several Saracens players, together with their wives and girlfriends, were enjoying a quiet evening when an uninvited stranger approached the group," read the statement. "A brief altercation occurred, which resulted in a friend of this stranger attacking Chris Ashton with a glass. The Saracens winger suffered two minor cuts on the left side of his face, but neither required stitches." Robshaw, speaking at the launch of England's new home kit, added: "As rugby players, we need to be seen and that's what people love about the sport, and players love that they can still go out and enjoy themselves. "You don't want to be locked away at home and told you can't go out with your friends or your girlfriend, that you can't go to the theatre or wherever because someone might do something."